When Vance Patterson, CEO of Patterson Fan Co., saw a couple of employees cooking hamburgers on a grill made of spare parts from the company's industrial fan products, he was intrigued. He talked the employees and they built him a similar grill for his birthday, with same flared parts that allowed heat to circulate more evenly. Some months later, Patterson patented the grill in the names of the two inventors and himself, and founded a new company to manufacture and sell the Town & Country Grill. If you want to discover opportunities before others do or even create opportunities before they emerge, ask yourself these five questions constantly. 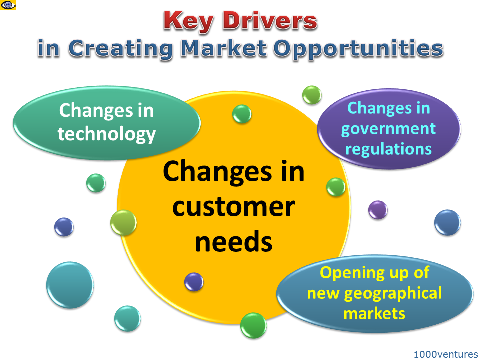 What are the trends that will change our market or industry? What will the daily life/business of our customers look like in 3 years from now? What are the unsolved problems of our prospective customers? What are the hidden needs and wants of people in our target market? What new product / service would make our target customers scream ‘WOW!’?